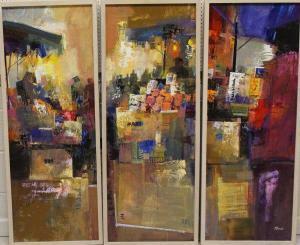 Find artworks, auction results, sale prices and pictures of Mike Bernard at auctions worldwide. MIKE BERNARD (b. 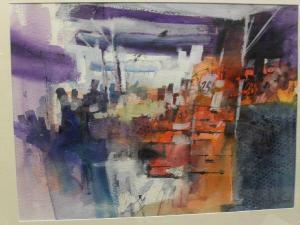 1957) "Portsmouth market", abstract study, watercolour, signed lower right, bears paper labels verso (ARR) CONDITION REPORTS 53.5 cm x 72.5 cm. Has thunder bugs, etc, underneath the glass between the mount and the edge and is in need of a clean. Some small bumps to the frame throughout. Otherwise general small signs of wear and tear conducive with age and use. See images for further details. * MIKE BERNARD RI (BRITISH b. 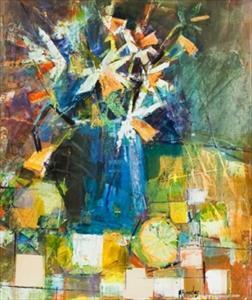 1957) DAFFODILLS AND LEMON mixed media, signed and dated '95 43cm x 38cm (17 x 15 inches) Framed Note: Mike Bernard was born in Dover, Kent. He trained at the West Surrey College of Art and Design, Farnham, followed by postgraduate studies at the Royal Academy Schools. Since then he has exhibited at the Royal Academy Summer Exhibition, Mall Galleries, Royal Festival Hall and many other galleries in London and the provinces. 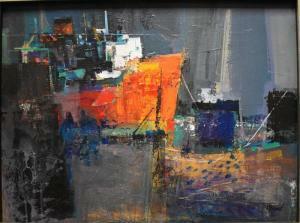 He has also gained awards and prizes for his paintings, including the Stowells Trophy, the Elizabeth Greenshield Fellowship, Silver Longboat Award and Laing Award. 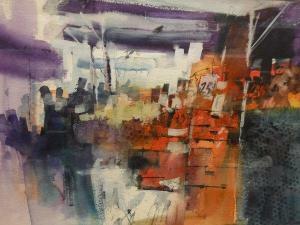 He was elected a member of the Royal Institute of Painters in Water Colours (RI) in 1997 and in the 1999 RI Exhibition at the Mall Galleries was awarded the Kingsmead Gallery Award.He is a regular contributor to The Artist magazine.